This is an email that I sent to our VIP email list a few months back. If you want these kind of information months in advance, get on the VIP List Today. Today’s value content actually comes from another VIP. Rich passed along a PDF that was just too good for me to read on my own. It’s a 21 page letter authored by Michael J. Mauboussin, Dan Callahan and Darius Majd from Credit Suisse. Easy to read and not as long as you think. A couple of weeks ago, I was in Washington DC visiting museums and learning more about American History, arts and other good stuff. Seeing as how I became a US citizen only 1.5 years ago, it’s been fascinating to learn how the US became the super power it is today. If you compare the USA to other countries in the world that existed B.C, something must have gone right for the US to have become the biggest economy and leader of the world. I strongly believe that a lot of the content in this PDF shows the characteristics and principles that brought about his type of exponential growth and leadership. The point is that, by applying the same ideas, we as an investor can train and acquire the same 10 traits, to become “investing superpowers”. The ability of accounting numbers to represent economic value is severely limited. Competitive strategy analysis and valuation should be joined at the hip. The litmus test of a successful strategy is that it creates value, and you can’t properly value a company without a thoughtful assessment of its competitive position. Stock prices reflect a set of expectations of future financial performance. Company stock doesn’t generate excess returns solely by the company creating value. The company’s results have to exceed the expectations embedded in the stock market. This is why it’s so important to run reverse valuations to calculation market expectations. Companies can increase earnings and simultaneously destroy value if the investments the company makes don’t earn an appropriate rate of return. present value of future free cash flow determines the value of a financial asset. This is true for stocks, bonds, and real estate. Valuation is challenging for equity investors because each driver of value—cash flows, timing, and risk—are based on expectations whereas two of the three drivers are contractual for bond investors. The idea is to distill the business to the basic unit of analysis. For example, the basic unit of analysis for a retailer is store economics. The classic approach is to analyze the industry and how the company fits in, and the common tools include the five forces that shape industry attractiveness, value chain analysis, assessment of the threat from disruptive innovation, and firm-specific sources of advantage. Making money in markets requires having a point of view that is different than what the current price suggests. Rather than asking whether this turnaround is similar to a prior turnaround, it is useful to ask for the base rate of success for all turnarounds. (ask inverted questions, not the same questions everyone else asks). Great investors recognize another uncomfortable reality about probability: the frequency of correctness does not really matter (batting average), what matters is how much money you make when you are right versus how much money you lose when you are wrong (slugging percentage). If the goal is grow the value of a portfolio, slugging percentage is what matters. 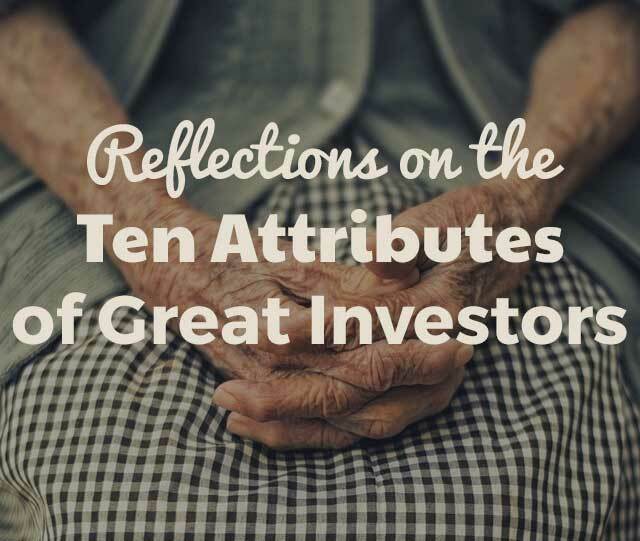 Great investors do two things that most of us do not. They seek information or views that are different than their own and they update their beliefs when the evidence suggests they should. Prices also provide useful information in capital markets. The main value is as an indication about expectations for future financial performance. Great investors take to heart all three of Pearson’s points, but money management is the one that gets the least attention in the discourse on investment practice. These are the points that I took, but read it for yourself and see how it speaks to you. My hope is that all who come across Old School Value will become Investing Superpowers. Once you hit 45 points, you are automatically added to the VIP list to get exclusive value added content. Click this link to sign up and receive old school value via email.